It’s hot here. Like a heat index of 105 degrees hot. It rains and steam rises right up off the pavement. I’m not kidding – I swear I’ve seen it happen. It’s the kind of weather where you step outside and the makeup melts off your face. Not pretty. So, the last thing you want to do after a day of sweating, gingerly grasping a scalding steering wheel, or hibernating in the A/C while waiting for the sun to go down, is to stand over a stove top and cook dinner. It just ain’t happening. 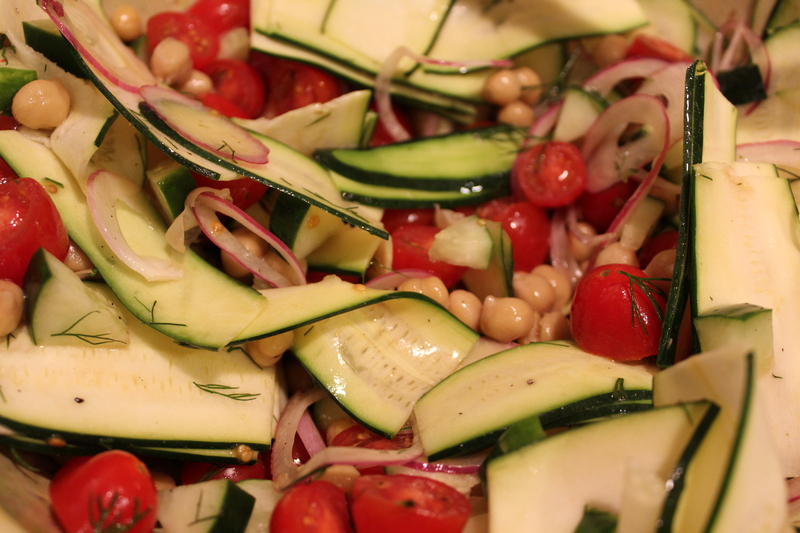 Instead, whip up this quick and easy zucchini ribbon Greek salad from Dr. Oz’s magazine, The Good Life. It’s healthy, full of flavor, and (best of all) doesn’t require any boiling, baking, basting, or broiling. It’s heat free! *The recipe also called for 3/4 cup crumbled feta cheese but I excluded it because I despise all things cheese… except pizza. Here is my strainer of lovely rinsed and drained organic grape tomatoes. Delish! As you can tell from most of my photos, I adore my collapsible, neon lime green strainer. Works like a charm and super easy to store. Maybe I have a thing for lime green kitchen gadgets? Here’s what three cups of halved grape tomatoes look like. Just FYI. Next, mandolin slice your zucchini. I found it easier if I cut the ends off first and then sliced the zucchini in half lengthwise. I just put the mandolin slicer right over the bowl of tomatoes and sliced away! Just look at that rainbow of nutrition – YUM. Add your chickpeas to your salad. Next, chop your cucumber into bite size pieces. Nothing says summer like the crunch of a crispy, fresh cuke. Add the cucumbers to the salad. Sprinkle on the chopped dill (not just for pickles!). … and olive oil. I found this brand at Publix Greenwise and so far it’s been pretty yummy! Toss the salad until ingredients are well mixed. Serve up the salad on its own or as a side dish to chicken or fish. It’s packed with vitamins and raw veggies and BEST OF ALL it didn’t require heating up the kitchen! What’s your favorite mid-summer, no-cook-bake dish? Yummy! I make a similar salad and it’s perfect for hot days!